Looking for a creative and tasty way to use up all of that leftover Thanksgiving turkey? This pasta recipe is the perfect way to enjoy those leftovers-- without having to eat one more turkey sandwich! I love leftovers as much as the next girl, but it's so easy to get bored with the same leftovers if you have a lot of one item hanging around. 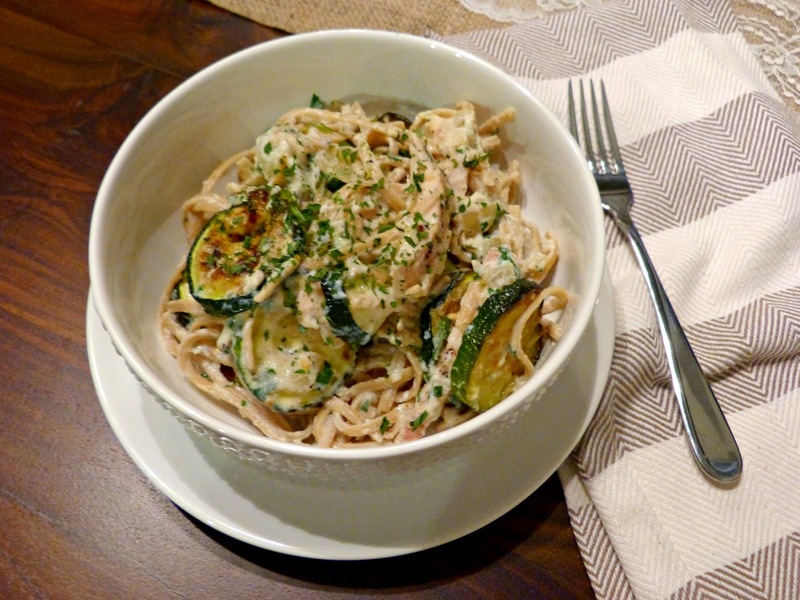 This recipe is a fun and different way to create a new dinner with that leftover turkey. Cooked turkey (or chicken would work fine too) is combined with roasted zucchini and nutty whole grain pasta and tossed in a simple and flavorful cream sauce. The secret to this easy sauce is ricotta, which creates a wonderful texture with mild flavor. That flavor is enhanced by fresh lemon juice and zest, white wine, and some spicy red pepper flakes. They keep the sauce feeling light and bright and not quite as heavy as you'd expect from a dairy-based sauce. I love easy dishes that can serve as an entire dinner in one bowl and this one definitely fits the bill. It's exactly the kind of meal that I want to make in the days following Thanksgiving when I just don't feel like spending a lot more time in the kitchen. So, stock your pantry with a few extra items and you've got dinner covered through the holiday weekend and beyond! Cook pasta according to package direction, reserving 1 cup of pasta water at the end. Preheat oven to 425 degrees. Drizzle 1/2 Tbs. olive oil on a baking sheet and arrange zucchini slices on sheet. Season with salt and pepper, drizzle with 1/2 Tbs. olive oil and roast for 15 minutes. After 15 minutes, remove from oven, flip zucchini slices over, and roast for 10 more minutes until golden brown. Heat remaining 1 Tbs. olive oil over medium heat in a large saute pan. Add shallots and saute for 4-5 minutes, until the shallots begin to soften and become translucent. Stir in garlic and cook for 1 minute. Pour white wine into the pan and bring to a boil. Reduce heat to medium and simmer for 6-8 minutes, scraping any browned bits off the bottom of the pan. Stir in red pepper flakes and lemon zest and cook for 2 more minutes. Remove shallot mixture from heat and add ricotta and lemon juice, stirring with a whisk. Add additional pasta water as needed to create a thick, but saucy texture. Toss pasta and parsley into the mixture to coat, adding more pasta water as necessary. 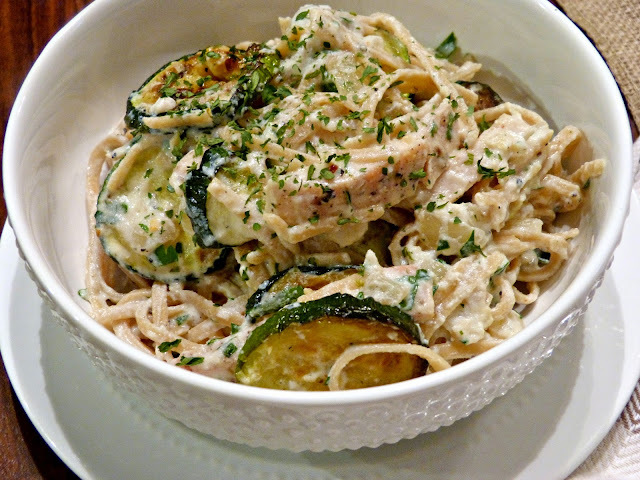 Add turkey and zucchini to the pasta and serve. Me too! One of my favorite combos.